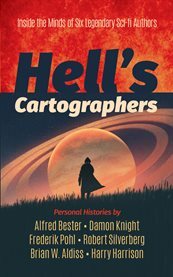 The item Hell's cartographers : some personal histories of science fiction writers, (ebook) represents a specific, individual, material embodiment of a distinct intellectual or artistic creation found in Charlotte Mecklenburg Library. What motivates great science fiction writers? Why did they choose the genre? Where do they get their ideas? In this illuminating volume, six of the field's bestselling authors present lively personal histories that provide fascinating insights into the creative process - and offer inspiration for aspiring wordsmiths. In the introduction, Brian W. Aldiss observes, "Never have critics and readers in any field been more divided than they are over science fiction." Aldiss goes on to define his concept of the difference between fiction and nonfiction in "Magic and Bare Boards." His coeditor, Harry Harrison, reminisces about his bookish childhood in "The Beginning of the Affair." "Ah, science fiction, science fiction!" sighs Alfred Bester in "My Affair with Science Fiction." He notes, "I've read it all my life, off and on, with excitement, with joy, sometimes with sorrow." Other heartfelt and insightful contributions include Robert Silverberg's "Sounding Brass, Tinkling Cymbal," Damon Knight's "Knight Piece," and Frederik Pohl's "Ragged Claws."